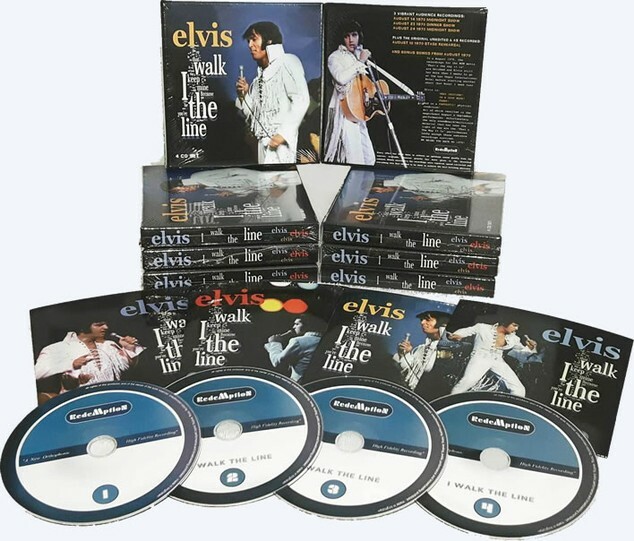 I Walk The Line 4 CD Concert Boxset | It's August 1970, the recordings for the MGM movie 'That's The Way It Is' are finished and Elvis still has more than 3 weeks to go at the Las Vegas International Hotel before starting another short (but busy) 1 week tour. And in a Fantastic! physical condition! All of which resulted in the magnificent August & September performances. Unfortunately the only soundboard/multitrack material that has seen the light of day are the 'That's The Way It Is' performances. Lucky enough these audience recordings survived! The August 14 1970 show has always been considered a very remarkable show, especially as Elvis is singing some unusual songs, like the two (2) Johnny Cash songs: I Walk The Line / Folsom Prison Blues. The August 14 show had some volume issues as appeared on the original tape, probably because of hiding the recorder. This has been corrected where possible. All performances have been re-edited and remastered and speed corrected where necessary. Also featured is the original August 10, STAGE REHEARSAL remastered from scratch using an original transfer of the reel. Without any edited or added intro or outros, just as recorded! A wonderful improvement to the original release from the 90's! These shows are too good to be missed in any collection! We Bring You Back To 1970!